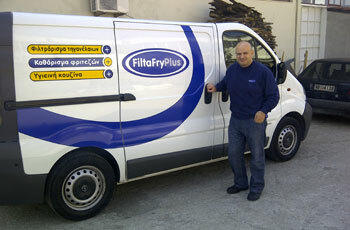 FiltaFry Plus, a successful UK-based franchise, has launched Master Franchises in Bulgaria and Greece. Last month saw the launch of the Greece Master Franchise, which is owned by Michaelis Tsaousis (pictured) and operated by a Greek team based in Thessaloniki. Franchise Manager Damian Slater from the UK team has just returned from Greece following a support visit in the country. According to FiltaFry Plus the reports coming back from Greece are very positive with a number of clients already signed up for the service, lots of demonstrations and meetings booked plus major discussions with a large Greek fast food restaurant chain are taking place. The UK team will fly back to Greece for further meetings scheduled soon with other major accounts. As well as the launch its Master Franchise in Greece, FiltaFry Plus has also seen the launch of its Bulgaria Master Franchise in March. The Bulgaria Master Franchise is owned and operated by Stefan Kolev from Sofia who has already secured over 190 clients to date. A major Bulgarian fast food chain has taken the service at all of its sites across the country and Kolev has already trained a team of technicians to take on the added work. More machines have already been shipped from the UK ready for the next rollout of business in Bulgaria, which will see franchise owners being launched in the Black Sea area prior to the summer season. FiltaFry Plus is also in discussions for the Master Franchise for Holland, and is actively looking for Master Franchise Owners across Europe, particularly for France, Spain and Germany.